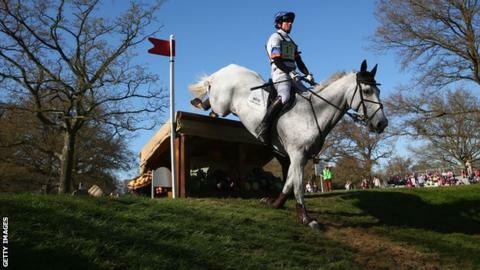 Britain's Francis Whittington lies third on Easy Target going into Saturday's cross-country at the Badminton Horse Trials. The Sussex-based rider is 0.2 penalties behind the 2010 champion Paul Tapner and his mount Kilronan in second place. United States rider Clark Montgomery, on Loughan Glen, leads after the second day's dressage on Friday. Another British favourite, William Fox-Pitt, is tied for seventh aboard Parklane Hawk. New Zealand's former double Olympic individual champion Mark Todd has two horses - NZB Campino and Leonidas II - in the top 10. Montgomery, on 33.3 points after the dressage, would become the first American winner of Badminton since David O'Connor 17 years ago if he triumphs this weekend. Weather conditions are forecast to be poor on Saturday, and soft going will be a stamina-sapping challenge, especially for the later starters.